ATA is a standard used by airlines for cases. It has become a shorthand expression for a certain style of case with certain types of latch, wheels, etc. EVERY case we sell meets airline specifications for shipping. 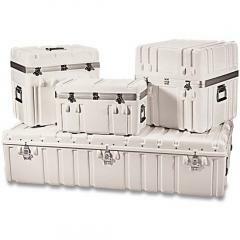 Although you do NOT need "ATA Style," this is a selection of some of the ATA style cases we sell. Confused? Call us! "Heavy Duty ATA Style Cases" are foam filled black cases in a variety of sizes. Guardsman Cases are a case style we frequently use for custom built cases - we can make these in any size you need. There are also a few standard sizes we keep in stock.